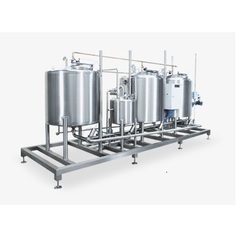 Leading Manufacturer of edible oil filling machine, beer fermentation tank, wine tank, cip system, clean in place system and fabricated tank from Ahmedabad. A type of yeast is selected and added, or "pitched", to the fermentation tank. 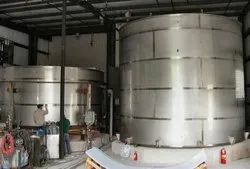 When the yeast is added to the wort, the fermenting process begins, where the sugars turn into alcohol, carbon dioxide and other components. Lean-in-place (CIP) is a method of cleaning the interior surfaces of pipes, vessels, process equipment, filters and associated fittings, without disassembly. Up to the 1950s, closed systems were disassembled and cleaned manually. 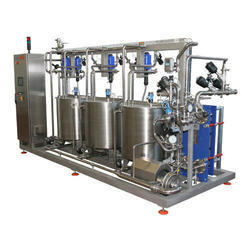 The advent of CIP was a boon to industries that needed frequent internal cleaning of their processes. 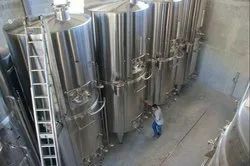 Industries that rely heavily on CIP are those requiring high levels of hygiene and include: dairy, beverage, brewing, processed foods, pharmaceutical, and cosmetics. Deliver highly turbulent, the high flow-rate solution to effect good cleaning (applies to pipe circuits and some filled equipment). Deliver solution as a low-energy spray to fully wet the surface (applies to lightly soiled vessels where a static spray ball may be used). Our CIP was a boon to industries that needed frequent internal cleaning of their processes. Industries that rely heavily on CIP are those requiring high levels of hygiene, and include: dairy, beverage, brewing, processed foods, pharmaceutical, and cosmetics. Looking for Clean In Place System ?